Live life with ease. Afghan Cow’s cerebral effects can cause one to be more alert. The mind goes completely silent, noticing everything as if in HD. Perfect plant to meditate on. The medicinal advantages of this plant is evident within 21 days of germination, with fat healthy stems, roots and leaves… as well as its delightful aroma. Is that a plant or a monster? Or is it both? It's an absolute marvel for sure. This is incredibly strong. Incredibly quick. Incredibly bulky. Simply Smashing! The brilliant genetics of The Incredible Bulk Auto crossed with Dr Kripple Blue Kripple, produces an autoflowering plant that goes on a raging rampage. One for the connoisseurs & daytrippers – Krippling’s 100% sativa mix’s bred for flavour & smell. This plant forms crystal ladened calyx, upon calyx, upon calyx…... with strong overtones of the hazes and mist + an undertone of orange bud. Buzz Light Gear ‘will not knock you for six’ or ‘shake you like a Polaroid picture’. A unique multi-tasting, multi-smelling strain. Some parts are toxically fruity, chemically, sweet and sour, yet some parts are earthy, dank with a pine forest aroma and flavour. Delightful chocolate flavoured buds are gifted from Choc-Matic in aprox 75 days from germination. 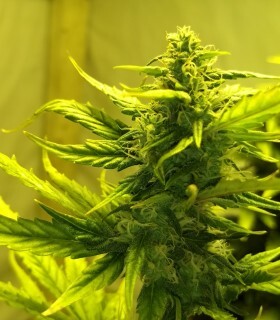 As with all our autoflowering strains, she is happy to rapidly grow indoors or outdoors, but it is advised to avoid too much stress as every day is a full time working day for these wonderful auto flowering strains. Bred to be a heavy resin producer ~ the effects and buzz of this plant are out of this world. Mr Krippling has stabilised a strain of seeds from our friends in New Delhi and crossed with our best Indian genetics available from UK. I'm so dizzy; my head is spinning!!!!! Check out and discover something new with this Krippling Northern Lights Auto strain ~ you can now have full access to Dizzy Lights. What do you get when Dr Krippling cross a strain originating from the jungles of Vietnam and Laos, with a classic re-working of the Big Bud?? Answer: “GANJ-NAM STYLE! “ This plant is so desirable, you will find all manner of excuses to avoid the tasks of the day, and spend some “high” quality time with this seductive beauty. Dr Krippling pulled out all the stops for their new Guy's Girl Scout Cookie Glue Auto Seeds! And, since that's more than a mouthful, they nicknamed these goo-covered beauties GGG #1 - so you can skip the tongue twister and get right down to business. 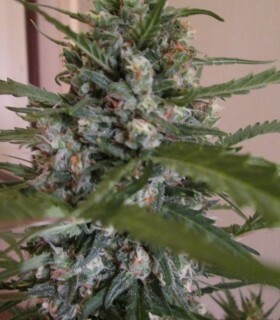 An Autoflowering plant from our strains in black. Thick, impenatrable buds, packed with gorgeous flavours of sweets and grapes. 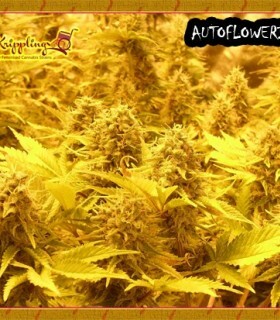 Autoflowering plants don't get much better than this. Black Domina heritage. Cor blimey Guv! Can that plant look any more menacing? WTF go on with them buds?!?! Has it snowed in here or something!?!?! The density in them nuggets is effin’ amazing!! OMG the smell is off the hook!! Krippling's mix of blueberries, with a touch of ruderalis, produces an autoflowering crop which closely matches the tastes and qualities of the original world famous strain. Tight compact buds, jam packed with a smooth fruity taste and intense aromas. Sweet, sour + spicy flavours to set your taste buds alight. Sweet citrus smells emanate out of each and every flower, exploding with fruity and fiery flavours. Team Krippling have experimented Willy Wonka style, to present this "popping candy style" strain of marijuana which never fails to tickle your tongue. 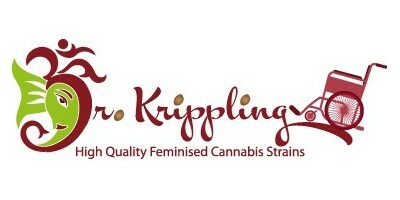 Want to feel connected with the Universe(s) and obtain some self-realization?Do not use this strain to achieve that goal is the advice from the breeders and testers at Team Krippling. You won’t like it. This stuff leaves you in mess. One of Dr Krippling quickest autos, this fast flowering, medium-sized plant with a compact and resinous compact core with hashy, kushy tastes, smells and effects got a big tick all round from all at Krippling HQ. Bred to spread the genetics of Mr Patel’s OG Kush from UK. Everyone was extremely excited at Team Krippling when they were unexpectedly gifted a few cuttings of this strain. The obvious choice and calling was to concentrate their efforts on mixing it with Delhi Friend. Selection of diesel strains from Krippling's pool of genetics, Pickled Diesel gives a solid, rapid bud with overtones of lemon, lime, orange & pineapple, with a hint of lavender, dill & spice ~ all on undertone tastes and smells reminiscent of its diesel and red grapefruit parentages. One beautiful mix of indian and Nepalese Genetics, which are mainly indica heritage. These plants seem to sing as they increase in size and fatten up daily. Get multiple Spinning Buzz Kicks to your head, back and legs, when experiencing this Krippling autoflowering strain. Don't miss out on this incredible Northern Lights crossed with Black Domina Auto strain. Bred to be a heavy weight performer, this plant does not disappoint. Ideally needs to be switched to flower before it is 2 feet tall, or else it can be difficult to maintain indoors.